Situate a small bowl of any material in a place of prominence in your home, somewhere you pass by every day. Each day for seven days put one dime in the bowl. Next, obtain a green candle, any shape or kind. Before you begin, fix in your mind the idea that you are a prosperous person. See money as being no problem. Imagine money coming to you, as you need it. Place the bowl of dimes or pennies, the candle and a candle holder on a flat surface. 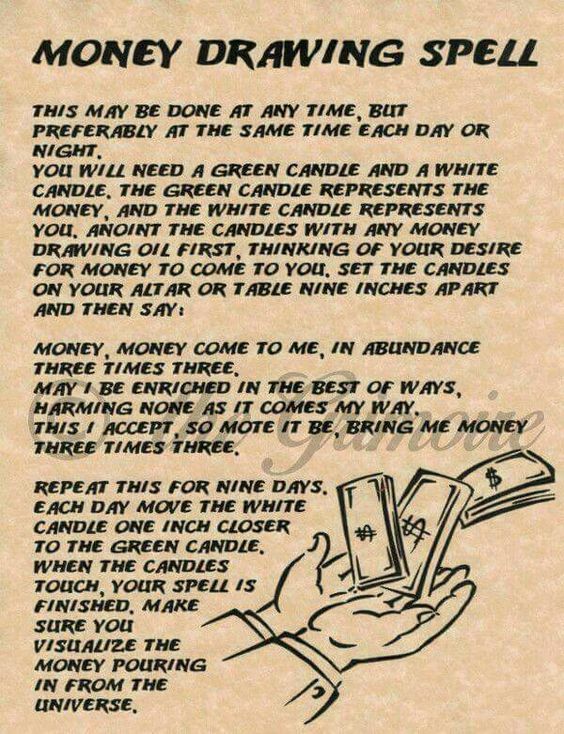 Hold the candles in your hands and feel the power of money. Repeat this 6 more times until you’ve created a circle around the candle with seven gleaming pennies (or dimes.) As you say the words and place the dimes, know that you’re not just reciting and fooling around with pieces of metal. You’re working with power – that which we’ve given money as well as that which is within yourself. Words too have energy, as does the breathe on which they ride. When you’ve completed this, light the candle. Strike a match and touch its tip to the wick. As it puts up the fire, sputters, to a shining flames, see money burning these. See the power of money flowing out from the seven dimes up to the candle’s flames and then out to the atmosphere. Blow out the match and settle down before the glowing candle and money. Sense the feeling of money in your life. Visualize a life with money to spare – a life in which bills are quickly paid and money will never again be a problem. See yourself wisely spending money, investing it for your future needs. See money as an unavoidable and beautiful aspect of your life. Kill off any thoughts of debt, of taxes, of doubt that you can achieve this change. Simply see what will be. After ten minutes or so, leave the area. Let the candle burn itself out in the holder. Afterward, collect the dimes, place them back in the bowl, & “feed” it a few coins every day from then on. Add words to ask that the money comes with harm to none…. and money will come to you. Assemble your items. 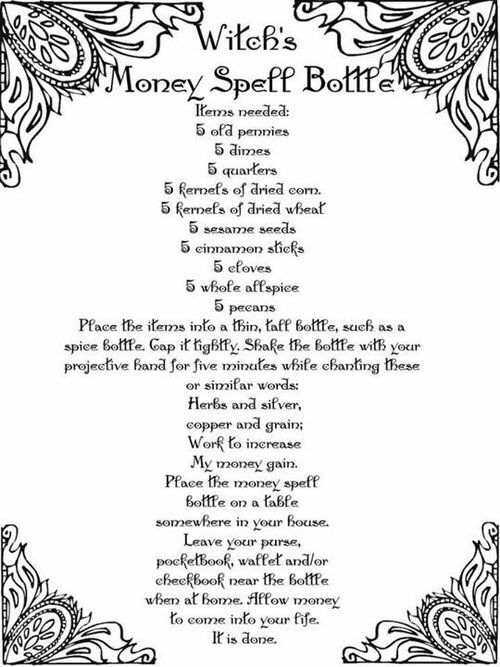 Gather some strong red thread, a whole nutmeg, and a paper money bill. Drill a hole through the nutmeg. You will also need sewing scissors or something to cut the thread. 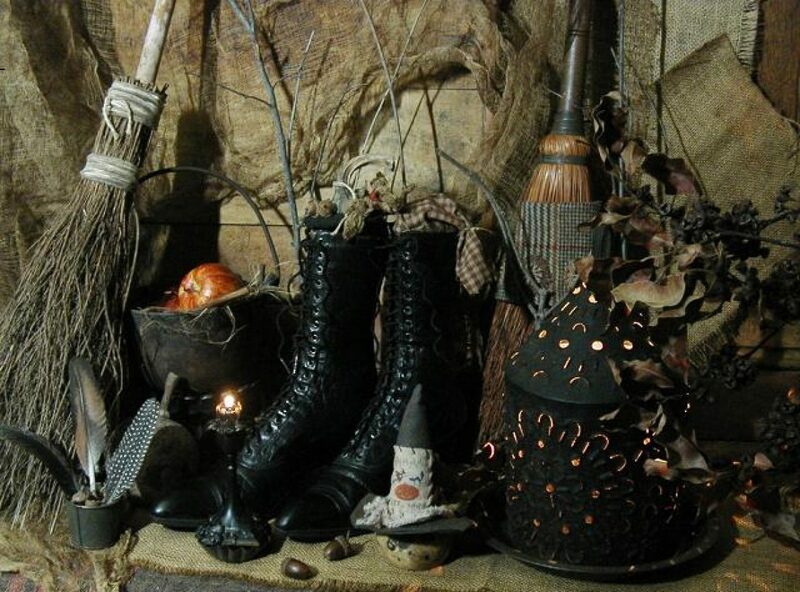 On one of the nights of the waxing moon, set up your altar with two white candles, one for Aradia and one for Diana. A third candle, red, white, or yellow, will represent the sacred fire. If necessary, other candles may be used for illumination. If you are outside, all candles will have to be in glass chimneys to protect them from being blown out. Don’t forget the matches. Representations of the other three elements, feather for air, bowl of spring water for water, stone for earth, should also be arranged on the altar. A cup or goblet of wine or juice to salute the Goddess should be on the altar as well. If you are inside, you will need a shallow dish to catch the libations. This libation bowl or dish may have stones, sand, or potting soil in it, or it may be empty. If you would like incense, vervain would be suitable, as would any scent associated with Diana or Aradia. Incense is not required for this ritual. If you prefer, the incense could stand as a representative of the element of air. By Dea della stella, this circle is cast. Blessed be, creatures of fire, flames of Vesta-Diana. Light any other candles you need for illumination. 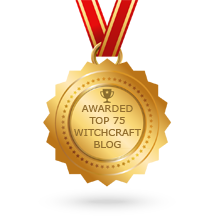 Use an invocation suitable for the purpose of making a prosperity charm, such as the one below. Hail Diana, mystery of the white moon among the stars, by growth and light and sprouting green, I invoke you; Hail Aradia, daughter of Diana, secret queen of witches; Hail and welcome. The ideal time to make this charm is under a waxing moon. Thread the hole in the nutmeg with the red thread three times. Fold the bill accordian-style, very small, and tie it to the nutmeg with the thread, again wrapping it three times. Blessed be, fragrant nutmeg. As this red thread drew this money to you, nutmeg, draw more money to me. By the increasing power of the moon, by the power of Aradia, by the power of three, draw to me money.O Diana of the heavens and earth, you are the pillar of life whose breasts are as many as dates upon a green tree. Let me have no want. Let me have enough. 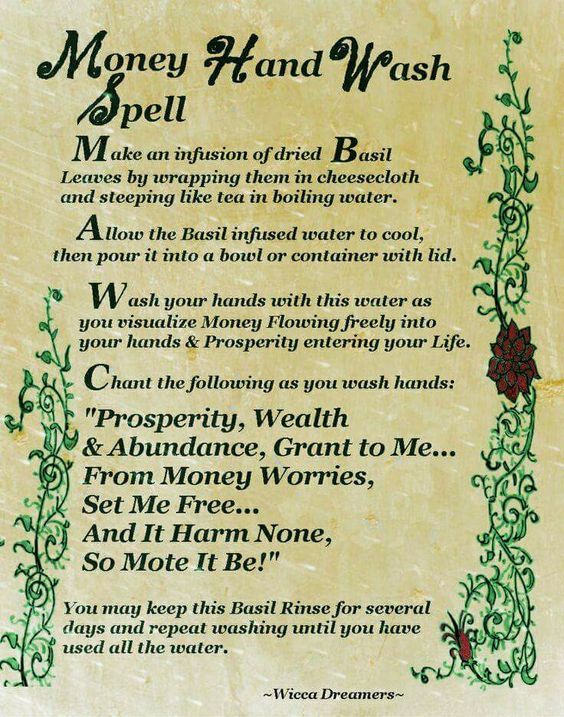 So mote it be. Cup your hands around the charm without touching it. Visualize a spark of light between your palms. Will this light to permeate the charm, empowering it. Visualize your purse full of money, and your bank account with a significant surplus balance. Feed energy into the sphere of light, so that the charm is strong. Trace a pentangle, the endless knot, in the air over the charm to bind the spell fast. Diana and Aradia, beautiful ones, in your honor I spill two libations. In celebration of you, I drain the goblet deep. If you are outside, pour two offerings of liquid on the ground. If you are inside, pour the liquid into the libation bowl, which may be emptied outside later. Drink the rest of the juice or wine. 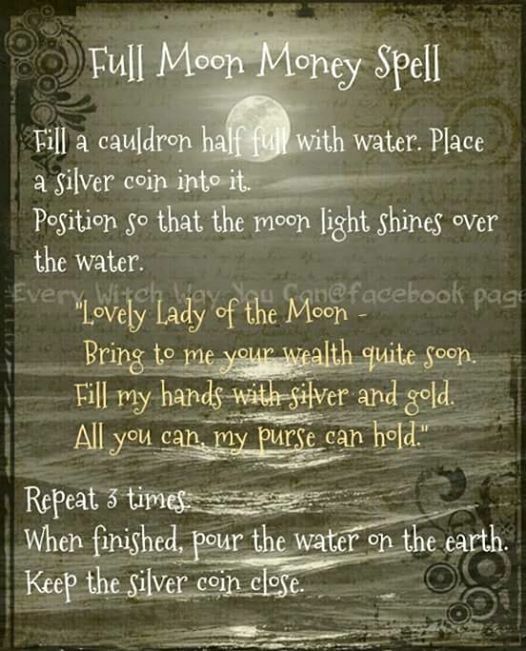 Thank you, lovely Goddesses of the moon, for your gifts, for your magic, for your presense here. By the Goddess of the moon and stars, this circle is erased. 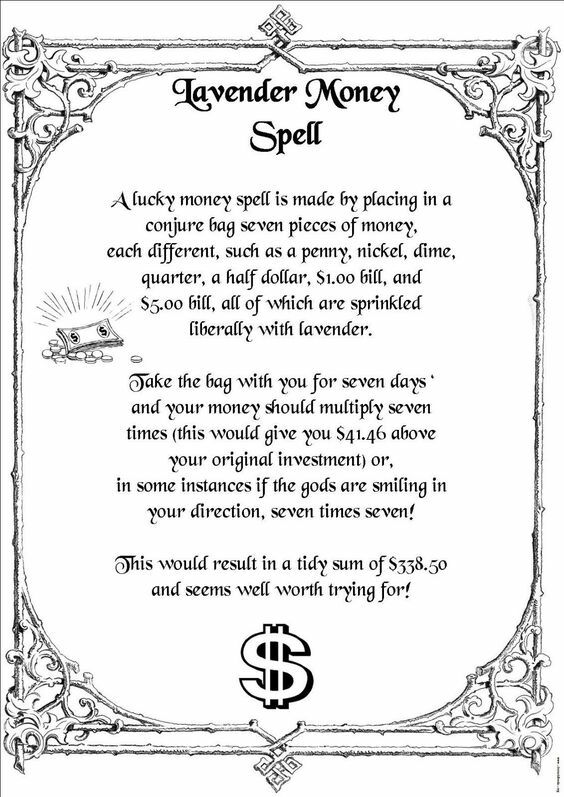 The charm should be kept in your purse, which you may annoint with a “Money Drawing” oil. 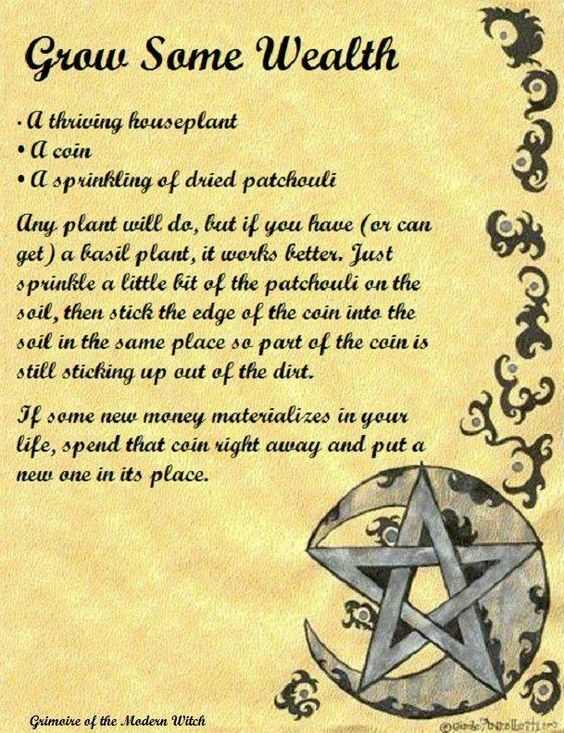 To protect the charm, you could bind it in a small, red bag and renew the oil every new moon. By Tuesday, most people are over Monday’s slump and are ready to charge. They feel more alert and energized on this day. Tuesdays are considered good days for communication, tenderness, taking care of business, and exercise spells. Sending this out in a run. After this chant, throw the pennies on-top of each other, on the ground. The hardness of the throw and the clanking of the pennies will send out the serious urgency of your spell. Spring, I welcome you at last. Growth and abundance are draw to me. Now I’m blessed with prosperity. As you weave the stem, visualize growth and abundance being bound to you. When you’re done, hang the wreath on a branch to the tree or shrub from whic it came. Thank the tree or shrub. You’ve created some positive karma, which will increase the flow of abundance coming to you.